Tamron’s SP, or ‘Special Performance’, range is targeted at the pro market and the Di suffix identifiesTamron lenses optimized for full frame DSLRS, although they’re compatible with APS-C cameras too. The SP 24-70mm is well specified featuring a fixed f/2.8 maximum aperture, Tamron’s USD, or Ultra Silent Drive, motor for quick and quiet autofocus and their VC, or Vibration Compensation, image stabilization system. Although not cheap the $1299 price tag is more affordable than own brand options like the $1887 AF S Nikkor 24-70mm f2.8 G ED and, as you’d hope at this price, build quality is good including weather sealing, a zoom lock switch and a large 82mm filter thread, although the manual focus ring is fairly narrow. 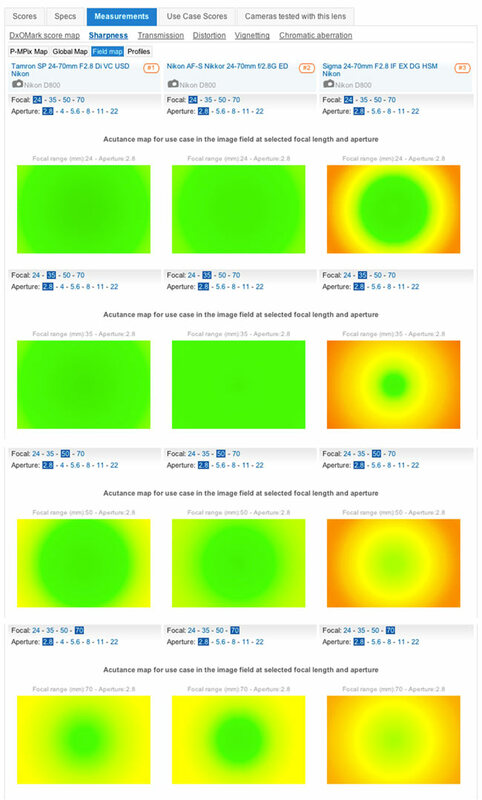 The optical arrangement features 17 elements in 12 groups, including elements and coatings to reduce aberrations and improve image quality, so let’s take a look at how it performs. Achieving an DxOMark Overall Score of 29 tested on the Nikon D800, the Tamron 24-70mm f/2.8 Di VC USD Nikon ranks 80th for all Nikon lens/camera combinations. 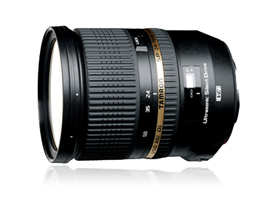 Crucially it ranks 1st for professional 24-70mm f/2.8 standard zooms. 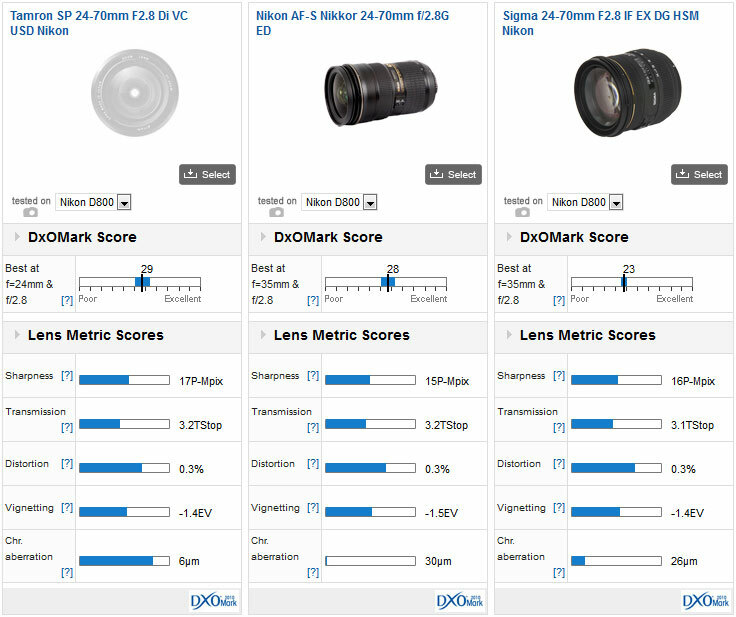 A sharpness score of 17 P-Mpix is impressive in terms of the direct competition again ranking 1st for pro standard zooms, ahead of the Nikon 24-70mm f/2.8G ED with 15 P-Mpix, and the Sigma 24-70mm f/2.8 IF EX DG HSM with 16 P-Mpix. Considering the huge 36-megapixel sensor in the D800 however a sharpness score of 17 P-Mpix is less than half of the camera’s resolution and put into that perspective is less impressive. So whilst the Tamron SP 24-70mm f/2.8 Di VC USD – and pro standard zooms in general – offer good features, build and versatility, lenses that cover such a focal range with a large fixed maximum aperture aren’t the sharpest. 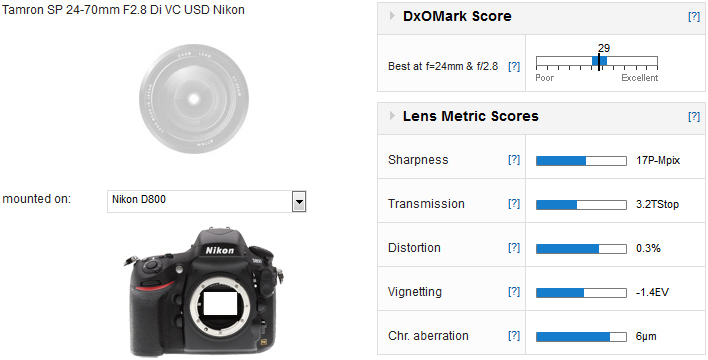 Despite the Nikon 24-70mm f/2.8 G ED costing nearly 50% more than the Tamron, they are very close for image quality, with the Tamron’s DxOMark Score of 29 just nudging out the Nikon’s 28. 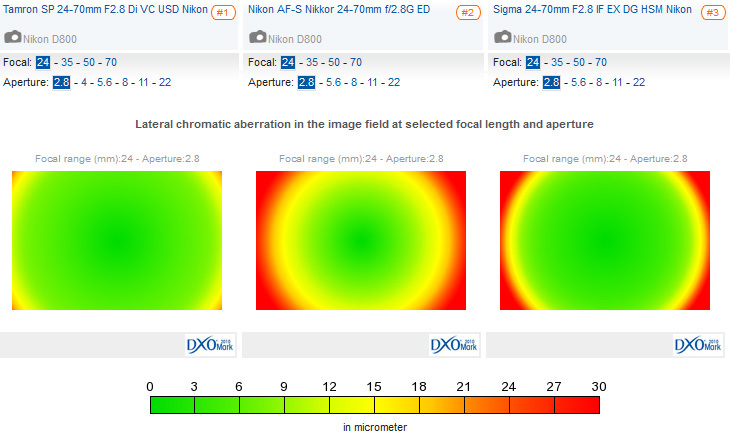 Both are way out in front of the cheaper $899 Sigma 24-70mm f/2.8 IF EX DG HSM with a DxOMark score of 23. Although very close in real world terms, lens vignetting and distortion results from the Nikon do just trump the other two, but it’s the Sharpness and Chromatic Aberration results where real differences start to show. 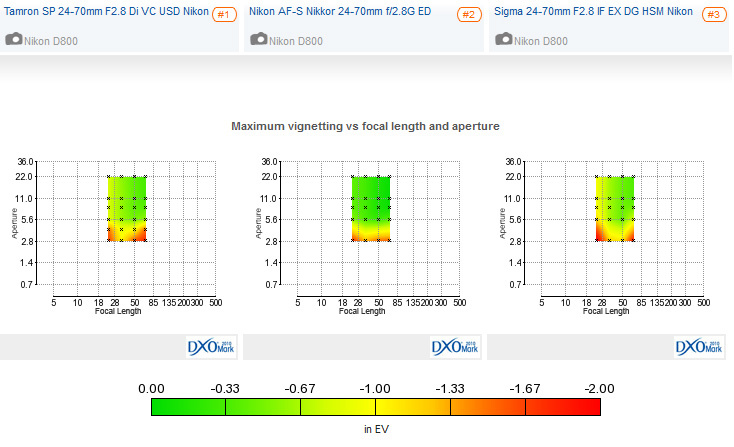 For vignetting the Nikon 24-70mm displays slightly less corner shading at each end of the zoom and a more consistent performance at all settings but the difference between the 3 lenses isn’t significant in this regard. All 3 lenses display a similar level of barrel distortion zoomed out at 24mm but at 70mm the Nikon 24-70mm f/2.8G ED suffers less from pin-cushion distortion compared to the third party competition. The Tamron is marginally the sharpest out of all three lenses overall and it’s very good with the aperture wide open at f/2.8, which is an important setting for a pro standard zoom. At f/2.8 the Tamron offers great edge-to-edge sharpness between 24-35mm, and although there is some drop off in the corners between 50-70mm, it’s well controlled. Results at f/2.8 between the Tamron and Nikon are similar and look very good in contrast to the Sigma 24-70mm f/2.8 IF EX DG HSM, which doesn’t offer homogenous sharpness at any focal length with the lens aperture wide open. 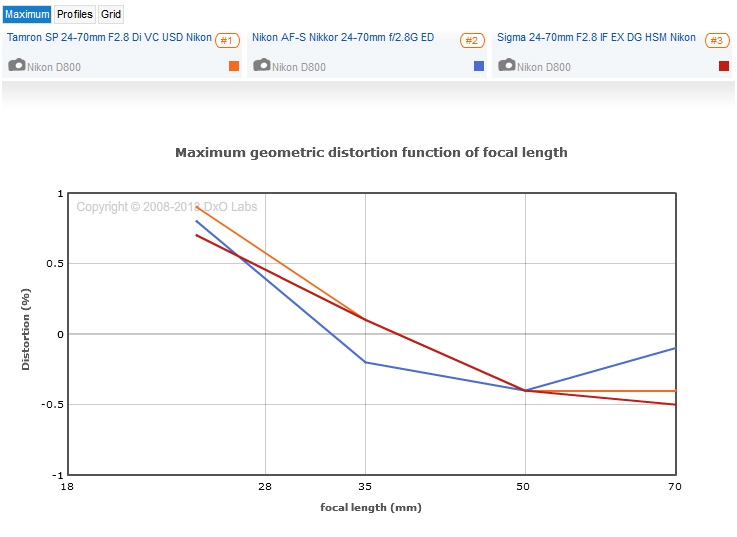 But stop down to f/5.6 and sharpness is more consistent between the three lenses. 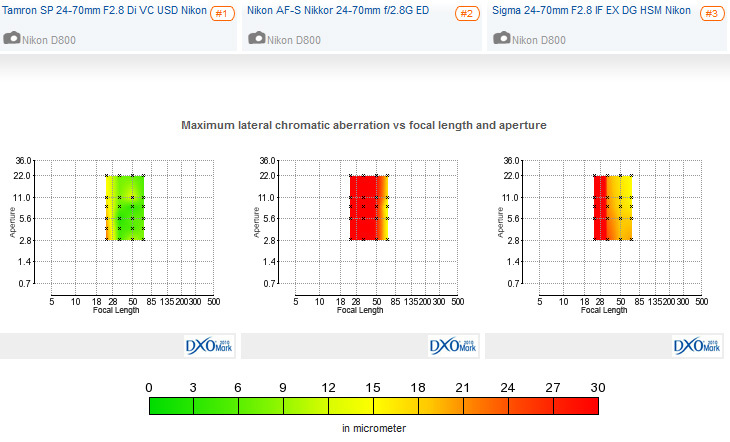 The final notable difference is Chromatic Aberration performance, where the Tamron SP 24-70mm f/2.8 Di VC USD puts in a sterling performance compared to the poor results from both the Nikon and Sigma. In fact the Nikon performs the worst in this regard with heavy fringing evident at all apertures and focal lengths, except fully zoomed in at 70mm, and while the Sigma offers a small improvement keeping things better controlled between 35mm -70mm, images still suffer heavy corner fringing at 24mm. In contrast the effect on the Tamron is extremely well controlled at all settings with the exception of 24mm f/2.8 where more minor chromatic aberration is evident, but this pales into insignificance compared to its rivals. Boasting great features, a solid build and most importantly top image quality, the Tamron SP 24-70mm f/2.8 Di VC USD is an excellent 3rd party lens for Nikon. A DxOMark Overall Score of 29 ranks the Tamron 1st for image quality on professional standard zooms, just pushing the own brand Nikon 24-70mm f/2.8G ED into second with 28 points, and is well ahead of the Sigma 24-70mm f/2.8 IF EX DG HSM with 23. The Tamron offers better sharpness overall, scoring 17 P-Mpix, compared to 15 P-Mpix for the Nikon, good performance at f/2.8 and boasts significantly better chromatic aberration results, too. What’s more with a $1299 price tag it’s a whooping $600 cheaper than the own brand alternative making it superb value for money for Nikon shooters.